In Egypt, in the middle of 2013, I was on a very important job: the Giza Pyramids investigation through mathematical proportional applications. I focused all my attention on the three mysterious and majestic pyramids, without exception. At that time, I believed in my heart that the buildings were keepers of scientific information, communicating the history of the pyramids builders. Now, I know it for sure! In the last two centuries, scholars and alternative researchers found many of the secrets of the Great Pyramid, following discoveries of the inside chambers. They brought us to the core of the monument, by revealing its architecture and engineering complexity. The building’s external features are well known, particularly, the pi-Greek relationship between base and height, or the relationship with planet’s geophysical properties, even its connection with the stars of the Belt of Orion. 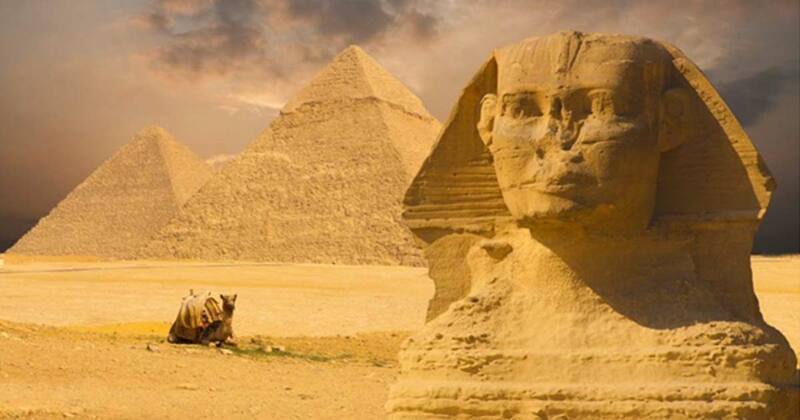 The Great Pyramid is almost an open book, while the other two pyramids are still a mystery. That is why I focused on the so-called Khafre and Menkaure’s pyramids too; I believe they still preserved ancient mysteries to discover. The Great Pyramid, through its scientific relationships, revealed to the world only part of its enigmas, so I had to follow up all scientific clues to discover the hidden messages coming from the Second and Third Pyramids of Giza. It was not easy to decide on a survey methodology to get a scientific result. The first step was to provide the two pyramids’ geometrical data to process. That procedure would allow me to demonstrate the existence of a scientific relationship that might unlock many unknown mysteries. I spent a long period gathering the external buildings measurements, subsequently further processed in Egyptian royal cubits. I needed to start thinking as the pyramid builders, if I wanted to find the truth. As shown in table above, the reference given in the first column (a) indicates the three major pyramids of Giza, that is: Kheops, Khafre and Menkaura monuments. The reference given in the second column (b) indicating measurements of base and height are expressed in meters, for each of them. 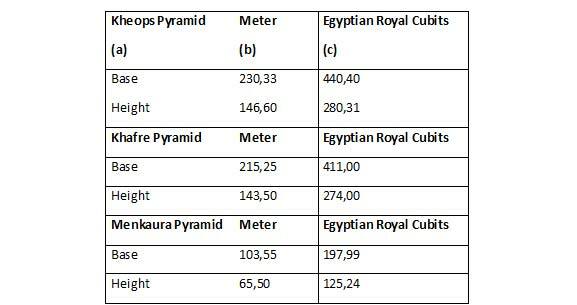 The reference given in the third column (c) indicates results of measurements processed in Egyptian royal cubits. The results took me another large step along the road to being able to discover the message coming from the pyramids. I was sure to find the clue that would lead me on the verge of a millenary secret. I also knew that it was like looking for a needle in a haystack! Moreover, even worse, I did not know either its form nor its content. The second step was to elaborate results through a very easy arithmetic simplification between base and height, for analyzing their relationship consequences. Jean Paul Bauval’s research on the Great Pyramid architecture is very interesting, as are his analytic models of investigation. He has shown that base and height relationship expresses two prime numbers: the number 11 for the base and 7 for the height. That is why I looked at his results as a reference point. The following table expresses the prime numbers as a result of the arithmetic simplification process. The applied model refers to Great Pyramid values in Egyptian royal cubits. Pyramid builders planned the monuments according to a scientific pattern, the aim of which was to convey a message about their knowledge. The number was used as a universal language, and it was applied in its simplest form so it could be known in the future. Its proposal was scientific and, as we will see later, esoteric too. I decided to apply the same analysis pattern to the Third Pyramid, or Menkaura Pyramid, going over the Second, or Khafre Pyramid. It was a random choice, maybe driven by the subconscious. Menkaura Pyramid is one of the most interesting monuments of Giza, due its shapes and the building materials the builders used for its construction. In addition, it is different from the other pyramids of Giza because of its size: the third pyramid is the smallest. The table results are very fascinating; firstly, because the Great Pyramid (Kheops) and Third Pyramid (Menkaura) have the same base relationship: the prime number 11. Second, the Third Pyramid height relationship expresses a different data: the prime number 5. Once again, a prime number possessed a deep esoteric meaning as result of my investigation. It was time to study the Second Pyramid (Khafre). It is a majestic building, such as the Great Pyramid. It is also keeper of very interesting structural elements, making it famous across time. The main characteristic, well known around the world, is the limestone rock covering its apex. Probably, that monument, of about 143 meters high (470 feet), still contains hidden chambers in the upper part yet to be discovered. The last step was to analyze the Second Pyramid through the arithmetic relationship. Results would allow me to compare the data and check for the existence of scientific evidence. I must say that I was astonished, when I looked at the data. The number 137, thus obtained, was very different in comparison with the previous data sets. It is still a prime number, but this time, its meaning has nothing to do with the prime number 11, 7 and 5… at least that is how it appeared. Was it a scientific message? What was the Second Pyramid’s purpose? I had to find the answer within the fields of mathematics. The formula for prime numbers—or pi-Greek function of positive numbers—is a formula generating the prime numbers, determining the amount of prime numbers preceding a considered value. For instance, how many prime numbers precede the number 137? I used the mathematical formula to discover the hidden message, based on the number 137, coming from the Second Pyramid. While Kheops and Menkaura Pyramid generated logical numeric values, closed to the first four prime numbers, the Khafre Pyramid gave, apparently, illogical results with no scientific connection with the others. By applying the prime numbers function to the number 137, I got the following result: the number 33, (i.e. the numbers 11 and 3). Once again two prime numbers. Once again, the number 11 as a proportional number for the base, and the number 3 for the height. The pyramids of Giza gave the following sequence: 3 – 5 – 7 – 11. The first four prime numbers were enclosed in the pyramid proportions; the number 11 as numeric constant for the base and then different values for the height (3 - Khafre Pyramid, 5 - Menkaura Pyramid, 7 - Kheops Pyramid). In addition, the Khafre Pyramid expressed a value, at the same time, proportional and inversely proportional to itself! Results also confirmed that the building had a twofold function: “from the bottom-up and from the top down”, “as above so below”. Giza really was the mirror of the sky? And what was the number 137 purpose? The number 137 has a very amazing meaning and it can range from modern science to Kabbalah, from archetypes numerology to Eastern philosophy, from smaller particles to the law of Universal Balance. Did the builders want to convey their scientific knowledge through the Pyramids proportions? Who built them? And why? Was their function connected to the number 137? Maybe, the last question can have a constructive answer in the esoteric and Kabbalistic meaning of the God Number. Hey or Hè is the Hebrew letter having the archetypal meaning of “Life”. Thus, the Kabalistic meaning of the number 137 is “ To go into the God House of dimension of Life ”. Here is one of the messages that the lost Civilization of the Pyramids want to convey. The message is written in the Second Pyramid’s proportions. The above image refers to the Hebrew letters to write Kabbalah, but 137 too. That means that Kabballah and 137 have the same meaning. It is the number of the Revelation, i.e. “to receive” the Ancient Tradition of the Tree of Life, from Adam to us. It is time to investigate the letters with corresponding numbers according to the esoteric meaning. The number 100 is the square of 10. It has a particularly important consideration in the Pythagorean culture. It was considered a divine number because its connection with the number 10. It is “completeness”, the esoteric correlation between “one and zero”, i.e. the Universe Unity. The number 2 means duality, the unity of opposite, which generates the triad. The Hebrew letter Beit is the God House, the universal matrix containing the Cup of Salvation. It is the Holy Grail containing the Blood of Christ. The number 30 is the 3, following the number 2. Its purpose is the Life Cycle renewed: birth-death-rebirth. Number 3 is the geometrical number for tetrahedron, the base molecular structure, which is related to the God Name. The number 5 is the last of the sequence. As an archetype it is the Letter “E”, symbolizing Life, handed down as the Tree from which Adam got the Knowledge Secret. It is the number of the Pentacle, of the Holy Geometry, forming the five-pointed Star. Originally, it was expression of Love, Femininity, and also matrix of the five basal elements of our dimension: Earth, Water, Fire, Air and Spirit, making up our life. It is also the letter V, connected to the Taurus Constellation as the Goddess Isis Revelation as Hator. As shortly shown, number 137 has many scientific, Kabalistic and archetypal meanings. Nevertheless, what are the other prime numbers’ purpose? What is the implication of the numbers 7 and 11? Number 7 properties are well known. In Kabbalah it is the letter Zain. Its purpose is eternity, transcending time. Do you remember the ancient Arab utterance concerning Pyramids and Time relationship? “Time is afraid of Pyramids”. Does the Pyramid’s function has a correlation with that hypothesis? Are the Great Pyramid Chambers the remains of ancient scientific process? Was the Second Pyramid, containing the number 137, part of the lost scientific process? Number 7 represents the Man in his Spiritual evolution, as Keter, the topmost of the Sephirot, the “crown” of the Spiritual Dimension. Number 11 is a very exhaustive esoteric number. It is the one following number 10, the Aleph following Tau, the Beginning following the Fulfillment. The number 11 is Kaf, the Hebrew letter indicating the new Cosmic Cycle, “the Entrance into the Eternity”. Our Ancestors told their history through particular numbers, by combining them with scientific functions. Over time, from their union, hermetic philosophies generated all around the world. What is the result of my investigation into the Pyramids? In my opinion, the Giza Plateau, with its mysterious and majestic buildings, seems to lead mankind to its origins, based on empirical correlation between science and faith, earth and heaven. We cannot yet assume that the pyramids were built by the Pharaoh’s workers around the fourth dynasty. The discovery of 137, hidden among the Second Pyramid’s proportions, is the evidence of complex scientific organization developed during the so-called Zep Tepi, the mythological Age of the Gods. The number 137 is a new tile in my composite “Historical Time the Zep Tepi Theory”. This is another extremely significant step towards the aim of unveiling the origins of mankind. The next phase is going to begin. The new project of research has the Second Pyramid as target. The goal is to discover the possible existence of hidden and unexplored chambers in the upper region. Their possible existence may give more sense to the number 137. It is a very difficult challenge, but the time has come. I dont understand the way of mathematical simplifiction. Is this a system of calculations? Your explanation and tables are confusing. I am not sure what mathematics you applied to obtain the above results. The ratio of height and base of Khufu's pyramid is indeed 7:11 (7x40=280, 11x40=440). However, it is NOT 5:11 in the case of Menkaura's and definitely not 137:137 for Khafre's. Menkaura's has the same 7:11 ratio as the great pyramid (7x18=126 and 11x18=198), and Khafre's is 2:3 (2x137=274, 3x137=411). And, as always in mathematics, simplification always results in prime numbers, no secret here. P.s. I am not a mathematician, either. You set an example proposed, times ago, by some researchers tried to make sense to Giza Pyramids dimensions. In my opinion, this interpretation of the number is a little bit of a stretch. It is an overall result obtained through an opposite approach, stretching the numbers. For example: 440 = 11x40 or 5x88 or 440x1 or 220x2 etc… the same goes for other monument’s dimensions. In the last 25 years, many researchers, scientists and people in the limelight, tried to answer to the mysteries of Giza by using the most complex formulas of maths. All that has created confusion, even impeded a new step towards finding a solution to this ancient question. Pyramids numbers “speak for themselves”, so easily. Why do we want to make incomprehensible the message coming from the past? For example, the Great Pyramid dimensions are: 440 x 280 E.R.C. In your opinion, what is the purpose? “Make an effort with your brain”? or simply “Analyze the number, that is my easy message from the past”? Second Pyramid: 411 = 2 x 137 (last prime number) 274 = 3 x 137 (last prime number). Those are certain, undeniable and irrefutable numbers, and they do not need other numbers to catch the pyramid dimension’s value. I apologise for not having gone into much detail on the 137 scientific meaning. People, who has the aim to do research, must have a clear head, free form stereotypes. That is the only way to go forward.